The Cardinal Quelea Quelea cardinalis is a small bird with a short stubby bill. The male in breeding plumage is separated from the similar Red-headed Quelea Q. erythrops by the red of the head extending onto the breast but not onto the streaked nape. The female has a yellowish face and superciliary stripes, and is told from the female Red-headed Quelea by a smaller, darker bill, and yellowish throat, but is probably not separable in the field. The non-breeding male resembles the female but has some red on its head. The Red-billed Quelea Q. quelea differs in having a red or yellow bill. 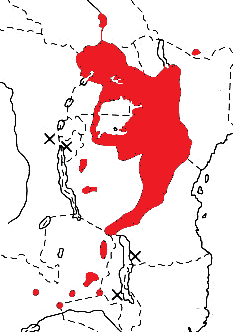 The Cardinal Quelea occurs in South Sudan, noth-eastern DRCongo, Uganda, western Kenya, Tanzania and eastern Zambia (see map right, based on Birds of Africa). No subspecies are currently recognised, although some have been proposed. The Cardinal Quelea inhabits rank grass or tall wooded grassland, especially in dry areas rather than marshes. It is ecologically intermediate between the Red-billed Quelea which inhabits relatively arid country, and the Red-headed Quelea which occurs in high rainfall areas. It often appears after rains, especially in normally drier regions. The Cardinal Quelea is highly gregarious, often being found in large flocks but also in smaller groups. Large flocks break up into smaller groups when breeding begins. The Cardinal Quelea forages on the ground, feeding on seeds, especially grass seeds, but also takes nectar. It is a pest of agricultural crops in some parts of its range. The nestlings are fed on insects, especially caterpillars, and regurgitated seeds. The Cardinal Quelea is polygynous. Colony size varies from large, dense colonies to small groups of nests, to sometimes solitary nests. Colonies of several hundred nests may form in areas where they were previously unknown. The nest is a domed structure, tightly woven of grass, with a large side entrance, and no porch. It is lined with finer grass. The nest is placed between the vertical stems of grass or other vegetation, or is rarely attached to the branches of a shrub. The male builds the nest, and may complete in a day, although some nests are abndoned before completion. If a female accepts a nest, the male may construct another nest as a roost site. 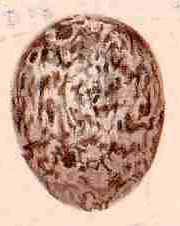 2-4 eggs are laid, and they are whitish, blue or greenish and finely spotted or mottled with reddish brown or greyish mauve. Nests may be parasitized by the Diederik Cuckoo Chrysococcyx caprius. 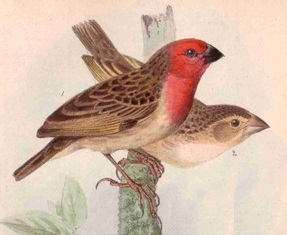 The Cardinal Quelea has no PHOWN records (see PHOWN summary) so be the first to submit a PHOWN record for the species! Submit any weaver nest records to PHOWN (PHOtos of Weaver Nests) via the Virtual Museum upload site.